One of the most obvious issues to emerge as I toured hospitals and spoke at conferences this past year was the importance of nurse managers in implementing shared governance. Nurses would quietly approach me after I spoke to tell me that shared governance didn’t have a chance in their unit because the manager didn’t buy into it. On the other hand, in analyzing data from hospitals, certain units would have outrageously high governance scores compared to other units in a hospital; the chief nurse would tell me that the managers in those units were the biggest advocates in the hospital for shared governance. What to do? Maybe someone could take all the managers in the hospital into a room and tell them it was shared governance or the highway? Or maybe someone could get it together to educate them on its and their importance in determining positive patient, organizational, and professional goals? This entry was posted in Issues & Opportunities on December 29, 2013 by Bob Hess. It’s been my experience that nurse managers will learn to embrace shared governance as they realize that delegating certain decisions to the staff free the manager up to be more strategic, more thoughtful in planning, looking ahead to the future. The Decision Making Profile is a great tool to use with managers to help them learn which decisions are appropriate to delegate and which decisions should not be delegated. This too may help managers let go and make the transition from manager to leader. when we first introduced the shared governance model at the American University of Beirut Medical Center in Lebanon, the nurse managers were very skeptical about the process. They were worried that they would have to let go of their power .As we engaged them in the process and had them act as facilitators, they later recognized the importance of nurses taking ownership to the issues. After 2 years of implementation nurse managers were very comfortable letting go .They actually realized that their role changed and had other expectations. In an environment like the middle east where there is strong hierarchy, we succeeded against all odds. In my experience, nurse managers are often confused about their role in shared governance – which is understandable since the idea that managers control and direct is widespread. Also, shared governance is mostly implemented within nursing and therefore the rest of the organization’s leaders are not well versed in how accountability for practice shifts to the practicing nurses and the nurse manager takes accountability for the practice environment. Managers are often fearful of giving up control for something they many in the organization feel is the responsibility of the role. For example, patient satisfaction is one of the performance measures of all clinical managers – even though the nurse manager is not expected to take care of patients as a primary role. In order for the manager to achieve this goal – the manager needs to translate this goal as an expectation of all nursing/employees in the manager’s department and part of everyone’s performance evaluation. I don’t find that it is a common practice for organizational goals to be translated at the employee level in their goals and APR. I see the potential lack of manager support as a system’s issue versus individual manager issue. 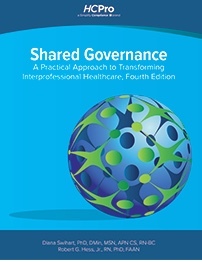 Just like staff nurses, managers must be knowledgeable about shared governance concepts. 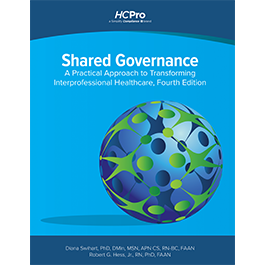 You cannot say, “OK, we have shared governance, you are empowered, now go do it!” First — at Lehigh Valley Health Network, we assure new managers have the knowledge of what shared governance means and how it is implemented within our organization. Second — managers must be held accountable for assuring a strong shared governance model. We do this by having the behaviors identified in the manager position description and evaluated on the annual performance appraisal. Also, staff nurse assessments regarding their perceptions of shared governance on their unit and within the organizations must be completed and, nurse managers held accountable when perceptions are the as desired. Third — On a biannual basis, nurse managers are responsible to assure their unit shared governance model is reviewed and revised, in accordance with templates for the model description and individual councils. These are submitted to me and I offer feedback if the same are not in allignment with shared governance concepts. In my experience, the most successful motivator for change is to demonstrate “what’s in it for (the person you want to adopt the change).” In the case of Nurse Managers, an organizational expectation alone is an insufficient ‘stick’ but, when accompanied by coaching and demonstration of how successful unit shared governance can make the NM a more effective leader, can provide the necessary reward and recognition that will keep the NM motivated. In one hospital, with which I worked closely on the enculturation of unit shared governance, one-on-one coaching plus opportunities to see USG in action on other units, and recognition from nurse executive leadership for outcomes of successful USG projects all combined to engage the Nurse Manager group. Interestingly in the article posted below by Wheeler and Foster, Barriers to Participation in Governance and Professional Advancement: A Comparison of Internationally Educated Nurses and Registered Nurses Educated in the United States the abstract states that “Nurses in both samples did not value participation in governance….” Managers are hampered if they are working with nurses who view governance as a “another thing to do”. Changing all nurses’ mental models of their work to understand that they are professionals and knowledge-workers and that activities to enhance the clinical practice environment is as much a part of their work as direct patient care is key to both shared governance and quality patient outcomes. I think this is the most difficult part of Shared Governance implementation (and I imagine, sustainability). In our hosipitals we’ve given education to Managers (individually and in small groups) on what Shared Governance is and how it can help the smooth running of their ward/unit. The reception of this training really has depended on that person’s leadership style. In my personal opinion, the areas who have managers who sit at the extreme ends of the mangament style spectrum, struggle with Shared Governance. By this I mean the “hands off manager”, who has a very laid back style. and the “full on manager” who wants to control every minutiae of detail. As you can expect, the “full on manager” finds it hard to relinquish control and the Staff struggle to influence as a result. Using that theory, you may think the Staff under the “hands off manager” have a great working model of Shared Gov. But they don’t, because they lack the support and facilitation to really run well. In these “extreme” cases, more support and education is needed for the managers on an individual basis. I’m finding that once the Unit level Councils are up and running and the manager can really SEE what they can do and how their work can harmonise with each other, they “get it”. (Not always, but sometimes)! I’m also finding that good old competeion between one area and another is helping to increase all levels of staff engagement in SG! We’re thinking of harnessing this peer pressure and turning it into peer support, so that managers can meet together to discuss their challenges/sucesses…a sort of self help group! I love the suggestions about how to integrate shared governance into the NM role, especially with the structure of the job description and annual performance measures! Something that we’ve found very useful at Sarasota Memorial has been the development of the Nursing Leadership Council. This council makes decisions about professional nursing practice concepts and practices as they relate to all nursing leadership roles (executive directors, directors, managers, assistant managers). This group powerfully sets expectations of leadership peer review for successful unit-based practice councils, as well as resource-based and work environment initiatives within the entire division – and it’s their own decisions in setting these expectations! I’ve also found some benefit to really encouraging the leadership nay-sayers and non-participators into key decision-making roles. In my experience, when shared governance was initiated in our institution, it’s much easier to have the shared governance structure in place, than to have it functioning and moving into the right direction. It took time to teach both nurses and managers how to make it work for them and their units. In the beginning nurses focused on their own issues with very minimal focus on patient care and outcomes. At the same time nurse managers lacked the experience to guide their nurses. Having a model for unit-based councils was greatly beneficial, as well as continuous training and education for both managers and nurses. The next step was inclusion of shared governance in all job descriptions for all nursing levels. The latest improvement we achieved was creating a tool to assess nurse participation and performance in the unit-based and divisional shared governance councils, which was linked to the annual performance appraisal for the nurses. Meeting with senior nurse administrators with the nurse and managers is a key to sustain the culture of shared governance. I have learned that shared governance, with all participants, takes regular, steady, patient education and commitment to bring people along and make decisions that are congruent with its philosophical foundation: professional accountability. When nurses from all areas of expertise are empowered to participate in an arena that reduces hierarchy and encourages focus on the patient as the center impetus for practice improvement, then direct-care nurses along with administrative nurses are necessary, as equal parts to fuel progress. I try to educate my staff to understand that shared governance as a vehicle for perfecting nursing practice must include all voices — faculty, inpatient, outpatient, administrative, direct, and indirect. A unit advisory council is incomplete without the input and resources provided by a knowledgeable administrative practitioner in the same way an administrative practitioner is stunted without real-time, trended input from those that touch patients constantly, our direct-care nurses. That said, education of managers is vital for helping them understand how to grow a successful structure. The importance of releasing the work to be equally participative and owned by all members runs, at time, counterintuitive to past models of administrative work product. Additionally, I agree with other above bloggers that sometimes our managers have an impression of what shared governance is, but due to the pressures and weight of their role, simply do not have the bandwidth to learn more or even become more savvy at making it happen. I have found that making a one-on-one happen with them, two to three times a year, to explain the structure as well as other key components that are also often misunderstood, such as professional practice models, care delivery models, or the difference between evidence-based practice, quality improvement, and research, goes a long way to caring for their developmental needs to understand professional accountability and all that goes along with living it out. Yet setting the pace, as a fellow leader, though in the Magnet role, in every meeting, and in every strategic decision to further structural empowerment and professional accountability to all nurses, regardless of specialty, can be tiring, but is necessary to hardwire a culture that is expressive of nursing leadership and ownership: with subsequent excellence in collaboration and patient outcomes as results. You can expect my strong response to this issue in my article, Shared Governance: No Turning Back, in the August, 2014 issue of Nurse Leader!